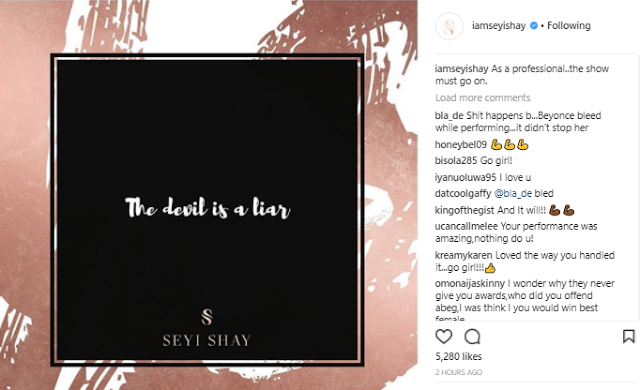 UK born Nigerian-based singer and songwriter, Seyi Shay, slipped and fell during her performance at the 2017 edition of AFRIMA. The Africa Music Awards, AFRIMA, which held in Lagos Nigeria may have been successful, but may not have left a found memory for Nigerian female artist, Seyi Shay who fell while performing her latest Yolo Yolo song. The artist who stormed the stage to put up an electrifying performance to spice up the event fell, but was quick enough to pick up her microphone to continue with her performance. It was not exactly clear why she fell, but it was observed that her long gown went between her legs and she slipped.